PRDM14 belongs to the PR domain-containing (PRDM) family. 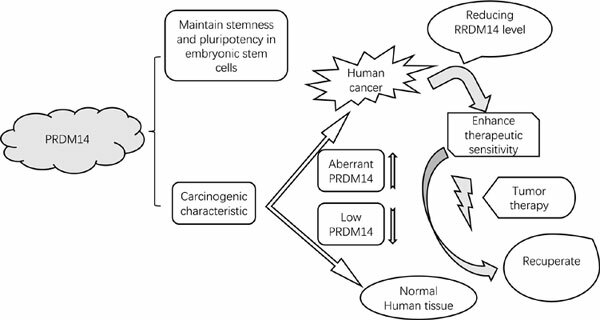 Although a precise understanding focused on the function of PRDM14 to maintain stemness and pluripotency in embryonic stem cells via epigenetic mechanisms, growing experimental evidence has been linked PRDM14 to human cancers. In adults, PRDM14 has low expression in human tissues. Aberrant PRDM14 expression is connected with various malignant histological types and solid cancers, where PRDM14 can act as a driver of oncogenic processes. Overexpression of RPDM14 enhanced cancer cells growth and reduced cancer cells sensitive to chemotherapeutic agents. Reducing the expression of PRDM14 in cancer cells can enhance the therapeutic sensitivity of drugs to cancer cells, suggesting that aberrant PRDM14 may have a carcinogenic characteristic in tumor therapy and as a new molecular target. This review summarizes the structure and oncogenic properties of PRDM14 in different malignancies and suggests that PRDM14 may be a potential therapeutic molecular target for tumor treatment. PRDM14, oncogene, chemotherapeutic resistance, PRDM family, molecular therapeutic target, cancer therapy.